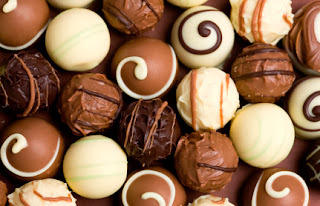 The sheer idea of tempering chocolate can be scary for many inexperienced candy makers. This fear leads many new candy makers to shy away from creating tasty chocolate masterpieces using some of the best melting chocolate available, such as our Merken’s Marquis Milk Chocolate. But it doesn’t have to be that way. With our step-by-step guide, you’ll see how easy this technique can be once you get past your fears. Using a microwave makes it super easy to temper your chocolate to get it to the perfect consistency, so we’re going to show you how to temper chocolate that way. Roughly chop your melting chocolate and add the pieces to your microwave-safe bowl. Microwave the chocolate for 20 seconds at a time, stirring well in between each 20-second interval. Keep putting the chocolate back into the microwave until the chocolate is mostly melted but still has some lumps. If you got a little overzealous while heating your chocolate and it all melted, don’t fear: Just add a handful of chocolate pieces to your melted chocolate and stir. Once your chocolate has gotten to the right consistency, transfer all of it to the chilled bowl and use your immersion blender to smooth out the lumps in your chocolate. Your chocolate will be ready to mold into candy when it dries in less than a minute. Once your chocolate is ready, ladle it into the candy mold of your choice and create delicious chocolate candies that your family and friends will love. Are you more of a visual learner? Watch our favorite video to learn how to temper chocolate in the microwave. The video also goes on to show how to mix different colors of chocolate to create beautiful candies. Have you ever tempered chocolate? Share your tips and tricks with us and other readers in the comments below!